To me at best it sounds like just a rejigging of service offerings with some potential improvements and additional choices, at worst it will mean either reduced service performance (UBA limited to 250Kbps) or price increases. Keen to hear from those more knowledgable in this area than me think about what this may actually mean to xSP's and end users? This has been discussed in depth in a number of recent threads in here. In a nutshell it'll mean no immediate impact to end users. Every product Chorus currently offers is regulated with the Commerce Commission setting the product specifications in place. Boost will give end users the option to buy a new commercial xDSL offering that's of a much higher quality than the current regulated offering. sbiddle: This has been discussed in depth in a number of recent threads in here. hmm, I did look before posting and could only find the one (locked) thread mentioned. 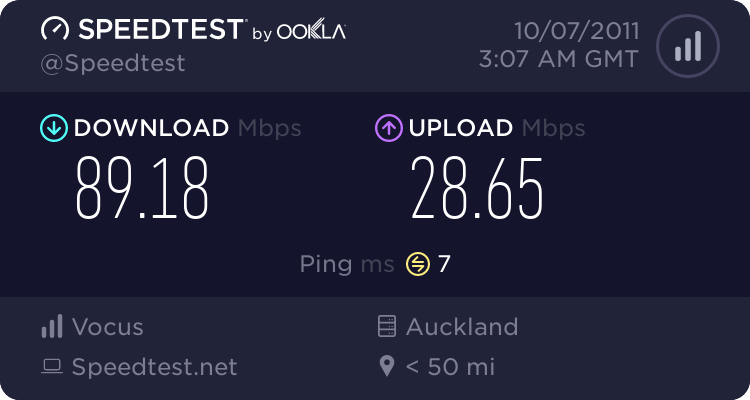 So do you think there is minimal-to-no risk of everyone on UBA connections suddenly being rate limited to 250Kbps unless their provider changes them to one of the "faster" products, presumably at a difference cost? ComCom should stamp hard on Chorus otherwise all we have done is replace the monopoly telecom with Chorus. Chorus (or what ever the equivilent) shouldnt be returning dividend to shareholders, profits should be reinvested. I think chorus should be a state owned asset analogous to the the national line distribution compay, or the motorways with the aim for provding the best service to benefit the country. From my perspective, the key to answering my last question is that the 250kbps will be/is a CIR. The Commerce Commission require UBA to have 32kbps CIR averaged over 15 minutes as the basis of their wholesale product. One can assume therefore that any calculations on wholesale costs are based around this figure. Chorus don't have to offer 250kbps, but are. Current EUBA average throughput (off the top of head, Chorus released this in their report) is currently 150kbps. If people have issues with this they really needing to be asking our inept regulator why it sees fit to have a wholesale broadband product that doesn't meet the requirements of the modern internet. sbiddle: The Commerce Commission require UBA to have 32kbps CIR averaged over 15 minutes as the basis of their wholesale product. One can assume therefore that any calculations on wholesale costs are based around this figure. And this is the real issue. There is a very real risk Chorus will let the regulated products drift down to perform at the minimum level and thus require ISPs to take the boost product in order to deliver the levels of performance the general public have come to expect. I see no chance of that. What I do see is a figure 8x the regulated requirement ultimately becoming a bottleneck in the future, which in itself really just proves how poor the regulated offering is. I don't disagree, it should be more regularly reviewed upwards.... however it's a minimum not a maximum... Chorus could you know act in good faith. My understanding is that With a cir, every line gets a guaranteed speed below which it will never drop. If it was a cir, you would always get at least 256Kbps no matter what anybody else was doing. I could be wrong, but I'm pretty sure this is correct. The old way of"retail minus" to set wholesale pricing could no longer work once Chorus was separated from Telecom, also it was a dumb way to set pricing in the first place and generally wholesale line access seemed overpriced in NZ compared to other counties of a similar size and geography. Chorus knew the ComCom was changing to cost + plus pricing before they were separated, it was listed in their share prospectus.... before they bid for UFB, if they underbid for UFB it's their own fault. It's not realistic for Chorus shareholders to expect big dividends during the UFB build, if you bought Chorus shares you bought them to hold for long term because as an infrastructure monopoly in the UFB regions they will still make good profit once the investment/build part is over. afe66: ComCom should stamp hard on Chorus otherwise all we have done is replace the monopoly telecom with Chorus. I second that - along with equal access by all players to the network. Competition occurring on those higher layers and it would be nice if (whilst we're dreaming) that the government puts down a massive fat pipe between NZ and the United States to drive the cost of overseas traffic into the ground so then we can have truly flat rate internet without all the jiggery pokery in the forms of transparent proxies and traffic shaping that keep breaking as well as making sure that all the players have an interconnection agreements at the major centres with no money changing hands.